The new F-35 Program Executive Officer, Vice Admiral Mat Winter, said his office is exploring the option of leaving 108 aircraft in their current state because the funds to upgrade them to the fully combat-capable configuration would threaten the Air Force’s plans to ramp up production in the coming years. These are most likely the same 108 aircraft the Air Force reportedly needed to upgrade earlier in 2017. Without being retrofitted, these aircraft would become “Concurrency Orphans,” airplanes left behind in the acquisition cycle after the services purchased them in haste before finishing the development process. Left unsaid so far is what will become of the 81 F-35s purchased by the Marine Corps and Navy during that same period. If they are left in their current state, nearly 200 F-35s might permanently remain unready for combat because the Pentagon would rather buy new aircraft than upgrade the ones the American people have already paid for. What makes this particularly galling is the aircraft that would be left behind by such a scheme were the most expensive F-35s purchased so far. When the tab for all the aircraft purchased in an immature state is added up, the total comes to nearly $40 billion. That is a lot of money to spend on training jets and aircraft that will simply be stripped for spare parts. The Pentagon and Lockheed Martin have been assuring the American people for years that the price tag for the F-35 is on its way down. Much of that effort was part of the campaign to convince Congress to approve the Economic Order Quantity, or multiple-year block buy of F-35 components. They claimed that would lead to even more cost savings. But it is difficult to be enthusiastic about the prospect of saving $2 billion when the program could potentially have wasted up to ten or perhaps twenty times that amount. The F-35 Joint Program Office considers leaving at least 108 aircraft —and perhaps an additional 81 or more—in a non-combat configuration because the cost to upgrade them is too high, making those concurrency orphans. Upgrades are unusually complex for the F-35 because of the design process being used for the program. The program is developing the F-35 in several phases, called blocks. Each block has more capabilities than the earlier version. According to the Lockheed Martin website, Block 1A/1B combined basic training capabilities with some security enhancements. Block 2A remained a training version, with the ability to share data between aircraft. 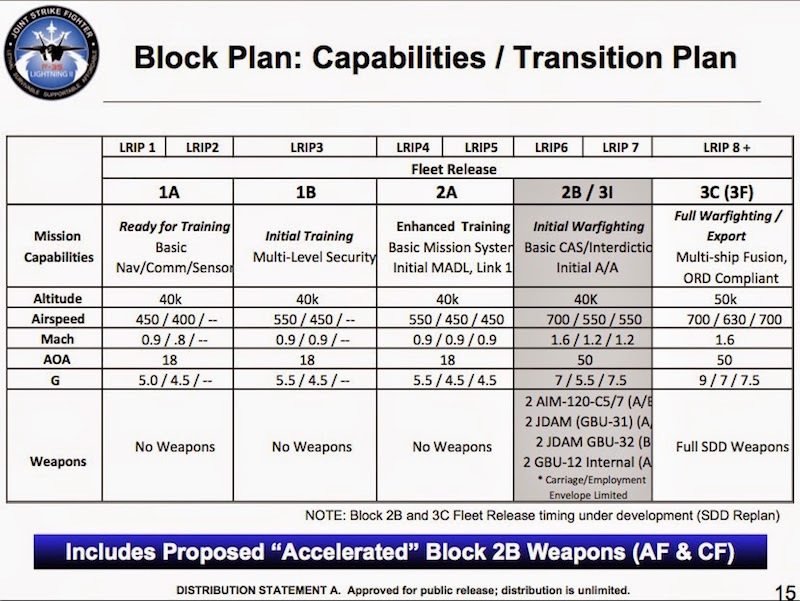 Blocks 2B and 3I are the first versions with any combat capabilities. The only significant difference between 2B and 3I is the aircraft’s computer processor. The first version expected to have full combat capabilities is Block 3F. This version has yet to be completed and is only expected to begin realistic combat testing next year. The Marine Corps controversially declared Initial Operational Capability with Block 2B aircraft in 2015. But this version is hardly ready for combat. The Pentagon’s testing office has repeatedly said that any pilots flying Block 2B F-35s who find themselves in a combat situation would “need to avoid threat engagement and would require augmentation by other friendly forces.” In other words, the 108 Air Force F-35s in question, or any of the Block 2B aircraft, would need to run away from a fight and have other aircraft come to their rescue. Getting to the bottom of exactly how much money has been wasted buying potentially combat-incapable fighters is a bit of a challenge. There are various ways to calculate the cost of weapon systems. To make it even more difficult, the numbers have been deliberately obscured by the Pentagon and the defense industry over the years. Using Lockheed Martin’s own numbers for aircraft deliveries, it is possible to make a few calculations to begin to get an idea about how much money may have been spent on these potential concurrency orphans. The defense industry likes to use the Unit Recurring Flyaway cost. This is just the material cost of the airframe plus the fee to have it put together. This figure sometimes does not include the cost of the engine and it does not include the support and training equipment, spare parts, software upgrades, or contractor fees necessary to actually make the aircraft work. Under the best-case scenario, the only aircraft that would remain concurrency orphans are the 108 Air Force Block 2B and 3I F-35As. (Emphasis added—Ed.) Without knowing exactly when the 108 aircraft in question were built, it is impossible to know precisely how much was spent to procure them. But, using publicly available information, it is possible to calculate a reasonably approximate figure since the Air Force acquired its first 108 F-35As in Low Rate Initial Production lots 1-9. Using the Lockheed Martin/Air Force figures (which are MUCH lower than the real costs) for the first 108 F-35As purchased, the American people spent approximately $14.117 billion to purchase fighter planes that will never be fully combat capable unless the Air Force spends the money to upgrade them. When you factor in the cost of the engine and the support equipment necessary to acquire an aircraft that is actually capable of operating, the dollar amounts are much different than what the Pentagon and Lockheed Martin advertise. This figure can be called the procurement unit cost. By simply multiplying the number of aircraft purchased per lot by average procurement unit cost for the corresponding year, the American people spent approximately $21.4 billion for those 108 orphaned F-35As. That is slightly more than has been spent on the entire four-year fight against ISIS. What remains to be seen is what will happen to all of the Block 2B aircraft remaining in the other services. During the period in question, the Marine Corps purchased approximately 53 Block 2B F-35Bs and the Navy purchased 28 Block 2B F-35C variants. The Project on Government Oversight submitted questions to the F-35 Joint Program Office and Lockheed Martin regarding whether the Navy and Marine Corps aircraft will be upgraded to the fully combat-capable 3F software configuration along with the other concurrency modifications, such as structural reinforcements. So far, no reply has been received from either office. When the costs to purchase all variants of the F-35s bought between 2007 and 2014 (the approximate timeframe the first 108 F-35As were purchased), are added together, taxpayers have spent $39.4 billion. The risk that the services would be stuck with less than capable aircraft is one that the Pentagon knowingly took when leaders decided to overlap the development and testing of the program with the production. That overlap is what is known as concurrency. While the F-35 program is still technically in “low rate initial production,” this is really only true in a strictly legalistic sense. Lockheed Martin is expected to produce more than 90 F-35s in 2018. This, like the 266 previously bought and contracted for (all U.S. F-35s purchased through 2017), seems to go somewhat beyond the “the minimum needed to provide production representative test articles for operational test and evaluation (OT&E) (as determined by DOT&E for [Major Defense Acquisition Programs] or special interest programs), to establish an initial production base for the system and provide efficient ramp up to full-rate production” standard established in the Department of Defense acquisition regulations. The danger of purchasing hundreds of aircraft before a program produced a stable and fully tested design has been well known for years. Concurrency, as a RAND Corporation analyst explained in testimony before the House Committee on Government Reform on May 10, 2000, is rooted “in the politics of the acquisition process.” As POGO has pointed out before, this practice serves to limit the available political options for restructuring programs experiencing significant test failures or cost overruns. When the Pentagon makes substantial procurement commitments well before development or testing is complete, it severely increases the political costs of cancelling the program due to all the money already invested and all the jobs already created. Dr. Michael Gilmore, the now-retired Director of Operational Test and Evaluation, warned that the services would likely have to send aircraft back to the maintenance depots for modification. The list of modifications is already quite extensive. The Air Force lists 213 change items in its FY 2018 budget request. The modifications required go far beyond mere software upgrades. They include serious structural upgrades including fixes to the landing gear, ejection seats, and the aircraft’s bulkhead structures. Some aircraft would have to undergo this process several times before they could be in the full combat configuration. This is an expensive process. The Government Accountability Office identified $1.8 billion worth of retrofitting costs to the program in 2016, with $1.4 billion going to already known problems and another $386 million worth of anticipated fixes that had yet to be identified. These figures are almost certainly much lower than the true cost to retrofit the aircraft already purchased because, as the testing process continues, it’s natural that more and more problems will be revealed. 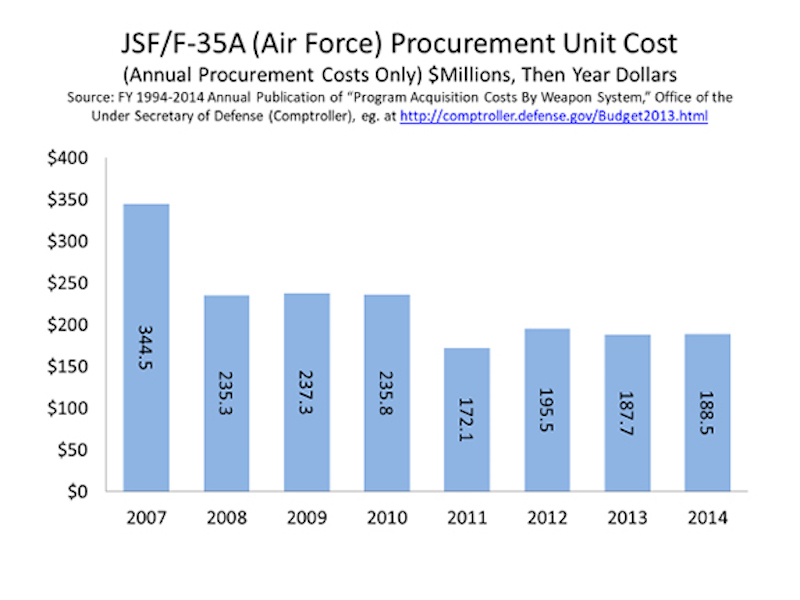 The F-35 program is expected to cost $406.5 billion in development and procurement costs alone. The true cost to upgrade the earlier generation aircraft must be much higher than what is being publicly reported if is the Pentagon has deemed it cheaper to purchase more aircraft. In total, Congress has authorized—and the Pentagon has spent—nearly $40 billion purchasing approximately 189 F-35s that, in their current configuration, will never be able to perform the way they were expected to when taxpayer dollars were used to buy them. This is hardly the right way to do business. Any future program must abide by the true spirit of the “fly before you buy” business model—unless of course neither Congress nor DoD nor the manufacturers really care about producing an effective and affordable system.